Do you kow why our Wogan Browne Suite is Called the 'Wogan Browne'? In the county of Kildare, in which he was well known and extremely popular with all classes and parties without distinction, the news of his tragic end aroused not merely a sense of horror, but also of real personal grief and deep-felt sympathy with family for many generations resident and honoured in the county. The gallant young soldier was the son and heir of Colonel F. Wogan Browne, of Naas ... representative of the Brownes of Castlebrowne or Clongowes Wood. Clongowes had been for nearly two centuries the home of this Catholic family, and though more than a century has elapsed since it passed from them to the Jesuits, the old ties of association has never been broken, and the kindlest relations have always been maintained between the representatives of the past and the present proprietors. We have no doubt that it was not without a pang General Michael Browne parted, in 1813, with the castellated mansion so long associated with family memories, but it must have been a satisfaction to the successive heirs of his line and name to feel that in this case the pathetic words of Job could not be applied: “Neither shall his place know him anymore.” The arms of the Wogan Brownes are still displayed over the main entrance door of Clongowes, with the incised Latin inscription commemorating the names of their ancestors who restored, enlarged and beautified the ancient castles of the Eustaces. Adjoining the College grounds stands the mausoleum of the family, containing monuments and memorials of interments from 1693 downwards. Moreover, after the sale of Clongowes, the family continued to hold a considerable property in the neighbourhood, which was finally sold to the tenants at the beginning of the present century. 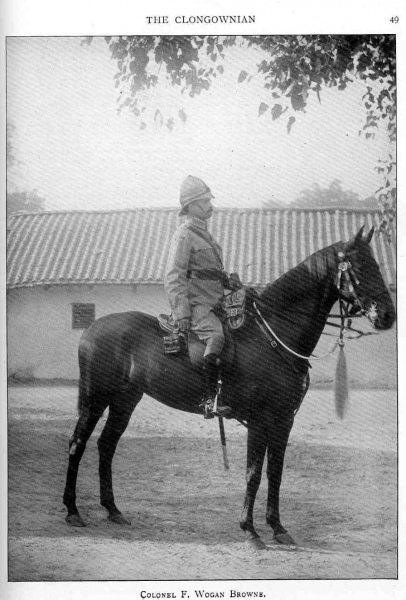 It is highly satisfactory to record that their relations with the tenantry were always friendly and paternal, and that even after the great agrarian crisis from which the country has recently emerged no bitter recollections of their ownership can be traced. 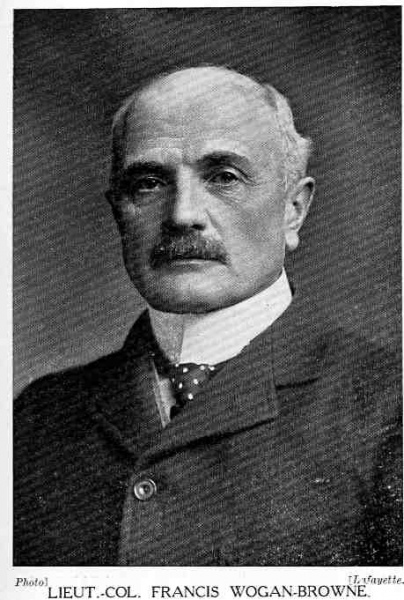 The death of his son was a crushing blow from which Francis Wogan Browne never recovered and shortly after he sold Keredern and left Ireland, never to return. He had already lost his other two sons to typhoid in 1886 and drowning in 1902. With the death of John Wogan Browne the family name disappeared from Ireland but was not entirely forgotten. On St Valentine’s Day 1954 the Wogan Society held a Wogan Family Commemoration at Malahide Castle, Dublin home of the Talbot de Malahide family, heirs of the Rathcoffey Wogans. Another commemoration was held in Co. Kildare on 13 May under the auspices of the Kildare Archaeological Society. 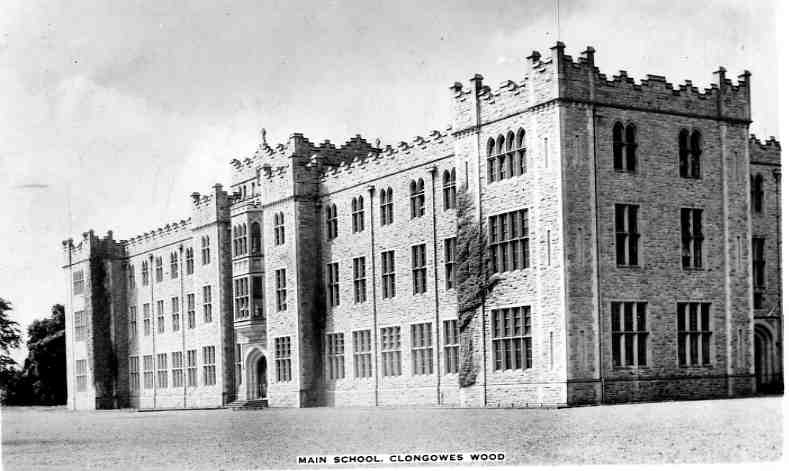 ‘This then was our real home and henceforth, all through the years the love of Clongowes is deeply rooted in us all ... in all those soldiers who went out to fight from this great house. General Michael Wogan Browne who was in the Kremlin with Napoleon, when news came of his brother’s death at Castle Browne, and who returned from here to attend the Congress of Vienna. His father, another General Michael Wogan Browne was brought up at St Germain with Prince Charles Edward and was one of the people who landed in Scotland with Prince Charlie in the ’45.